An ideal partner in the workplace, Corian® Solid Surface offers a wealth of attributes that can adapt to any number of aesthetic or functional demands. 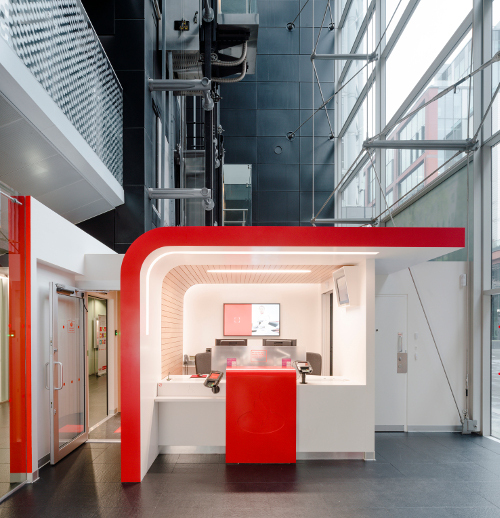 From high-impact reception desks to sleek washroom fittings, and from sophisticated wall cladding to high-performance desktops, Corian® is an inspiration to work with – from the planning stages to end-user occupation. Multiple studies have shown the importance of environment on productivity and well-being, from interior climate and air quality to light and visual stimulation. Corian® aligns with all such optimum conditions, while adding its distinctive tactile silkiness and an easy-care finish that can be kept pristine for the long term. Even if any unforeseen damage occurs, this homogenous and robust material is easily restored to full beauty, usually on site. These qualities make it not only a wise investment in terms of budget, but also for peace of mind. 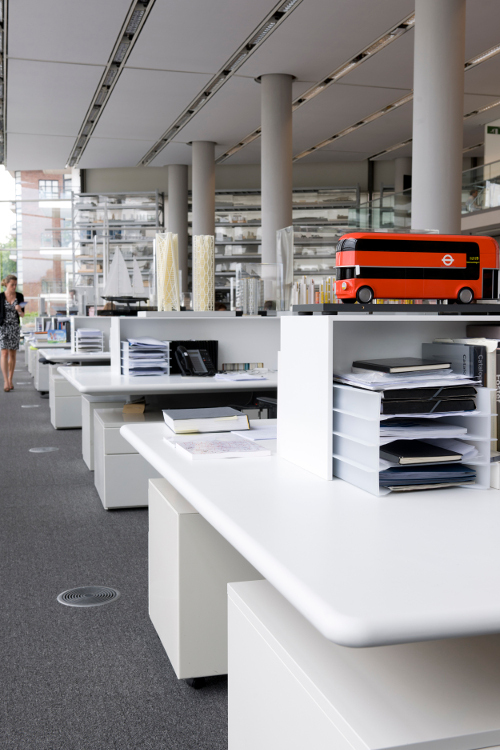 Foster + Partners London HQ: workstations made from Corian® in Glacier White, designed by Foster + Partners and fabricated by Interior Surfaces. Cleverly compatible with the demands of our digital age, Corian® lends itself to all kinds of technological integration. This ranges from smoothly encased touch screens to the discreetly embedded Corian® Charging Surface, which enables all manner of devices to be powered up wirelessly – directly on a desk surface, or a bespoke meeting table, kitchenette worktop or lobby coffee table. Santander retail banking branch within London head office: Photo courtesy of Santander UK, all rights reserved. The ability to customise Corian® Solid Surface according to a particular brand identity adds to its creative and commercial currency. This could mean sublimating a logo or a full photographic mural, engraving a discreet pattern or creating a 3D backlit wall sculpture to represent the company’s character. An extensive colour palette of over 100 carefully researched and exclusive hues allows designers to easily harmonise with the chromatic scheme of each project, but in sufficient quantity, custom colours to establish a unique identity are also possible. From individual solutions to adaptable products from specialist suppliers, Corian® offers the perfect blend of style and hygiene for washrooms. 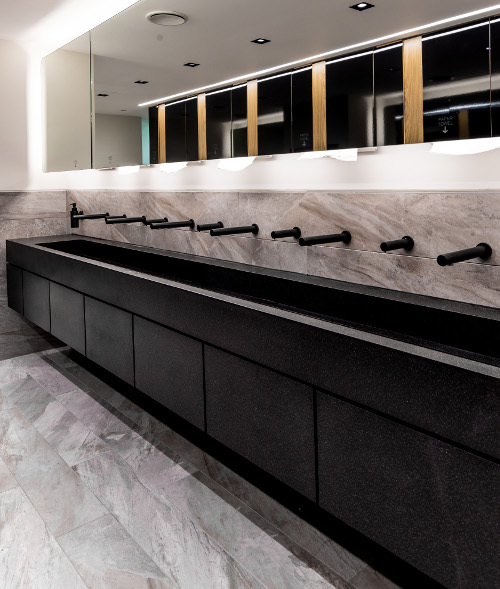 Non-porous, stain-resistant and flexible enough to create installations from troughs to integral vanities and wall-cladding to integrated splashbacks, Corian® also teams up happily with the latest in tap and hand dryer technology. Thermoformable into all manner of curves and shapes, the material’s many talents can be put to both striking and ergonomic use. A highly skilled network of trained and, experienced industrial partners is at the disposal of designers and architects who choose to work with a brand renowned for its technical know-how and reliable service. No challenge is too great or small, indeed, many of the now standard advantages of working with Corian® came to life through pioneering design/technical partnerships that invented a tailored solution to a particular challenge. 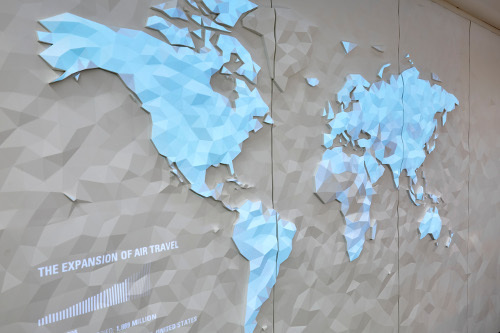 The Living Atlas: An interactive mural in Corian® behind the reception desk of Liberty Specialty Markets’s headquarters. Created by The Agency of Design and fabricated by Cutting Edge. Whatever the specific requirements of a workplace project, Corian® Solid Surface is a one-stop resource for premium surfaces that meet all the complex demands of today’s occupational environments. What’s more, the natural compliance of Corian® with future-proofed design makes it the smartest choice in modern materials. When forward thinking is called for, think Corian®.